We've all seen the Native American design trend lately and we think that when mixed properly with modern pieces this trend can be really quite beautiful. When looking to incorporate this trend, look no further than famed Portland, Oregon company Pendleton Woolen Mills. 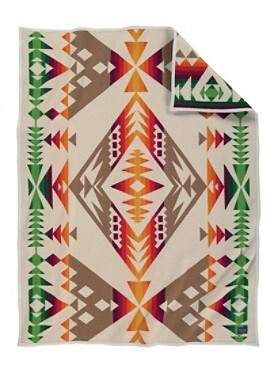 Known for their intricate patterns on blankets and throws inspired by Native American designs and for the softness of their lightweight, 100% pure virgin wool clothing, Pendleton has grown over the last 150 years to provide everything from their traditional offerings to furniture, bath, tabletop and home decor. Perfect for fall, we take you through some of our favorite pieces from Pendleton. This jacquard throw is just the right size for napping, reading or simply admiring. Toss it over a sofa or chair, or fold at the foot of the guest bed. The intricate and bright Native American-inspired design is sure to be a conversation starter wherever it lands. We love this classic leather carrier for it's style and function. The perfect size to hold a twin size blanket, the carrier features a convenient handle and shoulder strap. Right on trend for fall, the Native American-inspired geometrics of this piece are laser-engraved on eco-friendly bamboo. We love the stainless steel pump with antique bronze finish. Part of the same collection as the Bamboo Basket Lotion Pump, the Native American-inspired geometrics on this toothbrush holder are also laser-engraved on eco-friendly bamboo. We think it would also look great on a desk and filled with pens and pencils. Raise a glass to minimalist Native American-inspired style. The tumbler rests on a coaster made of eco-friendly bamboo, laser engraved with a single row of arrows. The best-made and most stylish axe we could imagine, the Thomas Kay Axe is created by Best Made Company of perfectly weighted high-carbon US steel with an Appalachian hickory handle and includes a leather sheath. Made in the USA. The Father’s Eyes blanket by Pendleton Woolen Mills is a tribute to the men who watch over and guide us as we journey through this earth. A portion of the sale of each blanket will benefit the Men's Health Network, a nonprofit dedicated to improving men's lives through better health. A classic essential for camp, picnic or backyard fire-pit this stool is expertly crafted in Oregon with hardwood ash legs and a seat of jacquard fabric, woven in Pendleton's American mills.